Once upon a time, the Romans laid out a graveyard along the eastern side of the road leading north from the City of London, in the manner of the cemetery lining the Appian Way. 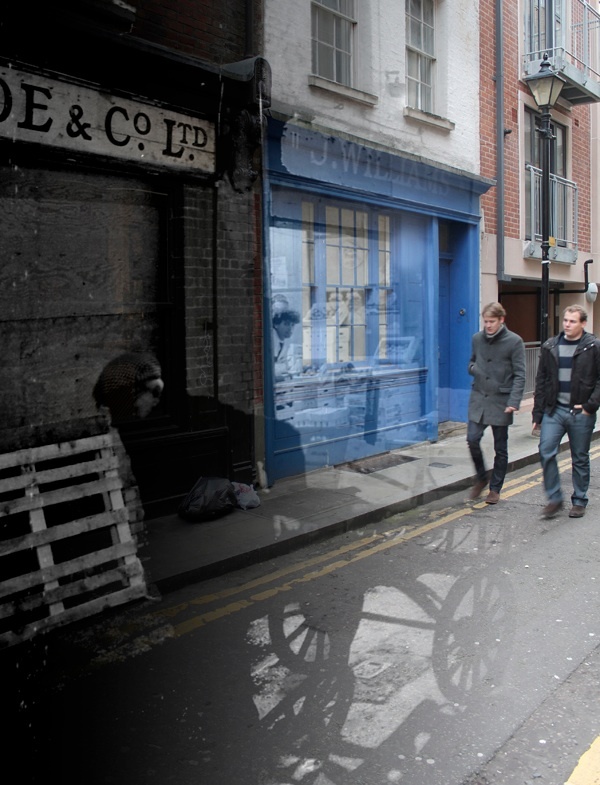 When the Spitalfields Market was demolished and rebuilt in the nineteen-nineties, stone coffins and funerary urns with copper coins were discovered beneath the market buildings – a sobering reminder of the innumerable people who came to this place and made it their own over the last two thousand years. 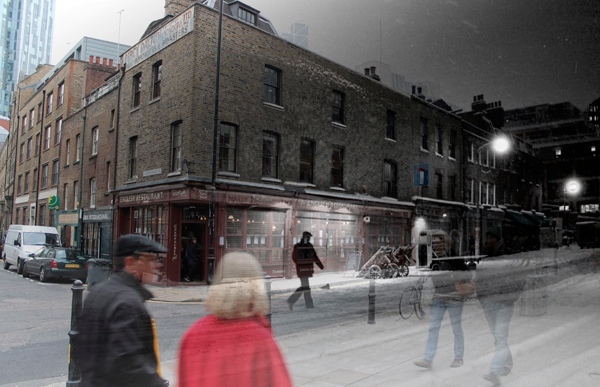 Outside the City, there is perhaps no other part of London where the land bears the footprint of so many over such a long expanse of time as Spitalfields. 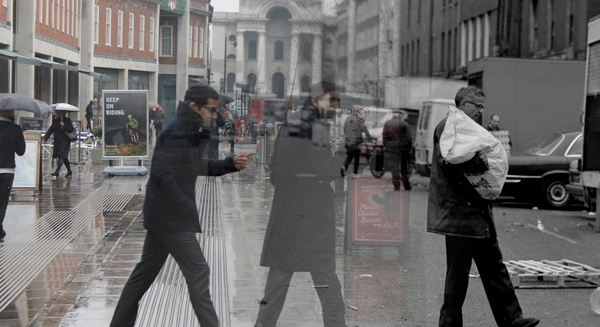 In his work, Adam Tuck plays upon this sense of reverberation in time by overlaying his own photographs upon earlier pictures to create subtly modulated palimpsests, which permit the viewer to see the past in terms of the present and the present in terms of the past, simultaneously. He uses photography to show us something that is beyond the capability of ordinary human vision, you might call it God’s eye view. 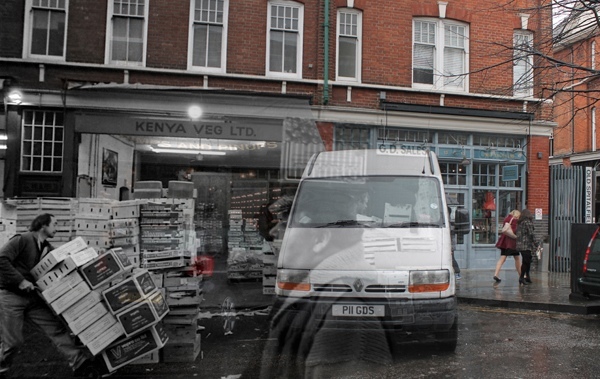 Working with the pictures taken by Mark Jackson & Huw Davies in 1991, recording the last year of the nocturnal wholesale Fruit & Vegetable Market before it transferred to Leyton after more than three centuries in Spitalfields, Adam revisited the same locations to photograph them today. The pictures from 1991 celebrate the characters and rituals of life within a market community established over generations, depicted in black and white photographs that, at first glance, could have been taken almost any time during the twentieth century. In Adam Tuck’s composites, the people in the present inhabit the same space as those of the past, making occasional surreal visual connections as if they sense each others presence or as if the monochrome images were memories fading from sight. 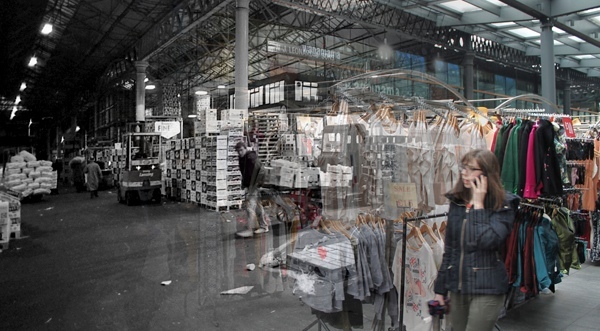 For the most part – according to the logic of these images – the market workers are too absorbed in their work to be concerned with time travellers from the future, while many of the shoppers and office workers cast their eyes around aimlessly, unaware of the spectres from the past that surround them. Yet most telling are comparisons in demeanour, which speak of self-possession and purpose – and, in this comparison, those in the past are seen to inhabit the place while those in the present are merely passing through. 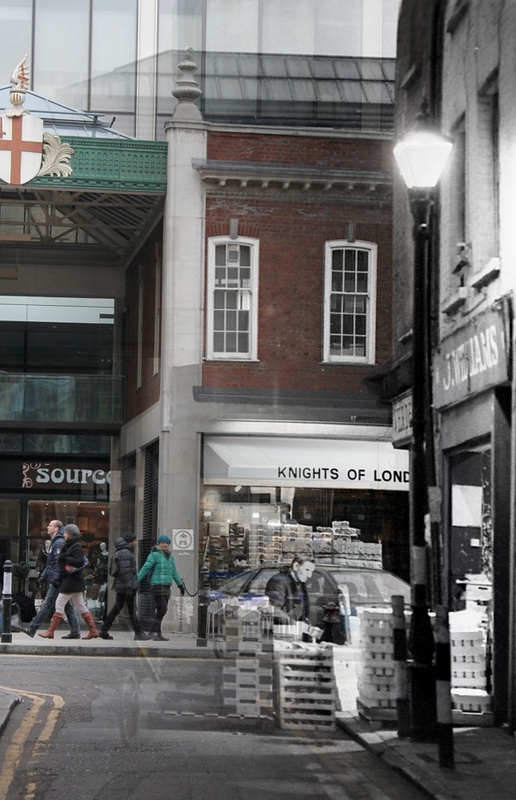 Although barely more than twenty years have passed since the market moved out, the chain stores and corporate workers which have supplanted it belong to another era entirely. There is a schism in time, since the change was not evolutionary but achieved through the substitution of one world for another. Thus Adam’s work induces a similar schizophrenic effect to that experienced by those who knew the market before the changes when they walk through it today, raising uneasy comparisons between the endeavours of those in the past and the present, and their relative merits and qualities. Looking out from Gun St across Brushfield St.
Northern corner of the market. Lamb St looking towards The Golden Heart. Remarkable, my spine was tingling. Utterly brilliant. It makes me want to see a film done in the same way. 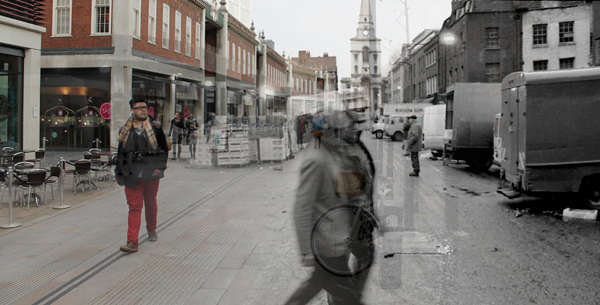 The ghosts of Spitalfields. Another fabulous post, thank you. How interesting. Extraordinary how the 1990s photos seem to belong to a long-existing traditional way of life, which only a few years later has beeen superceded. Love the juxtaposition ! I remember the ‘old’ and visit the ‘new’. Makes you want to reach back to those workers and say … sorry, thank you … and then you wonder about the future and what part we play in it. Yes, spine tingling. What amazing photos. Love the man from 1991 checking out the BMW of 2013. I can’t tell you how much I love these superimposed images. The old adage of “a picture is worth a thousand words” certainly holds true with these pictures. History at a glance. 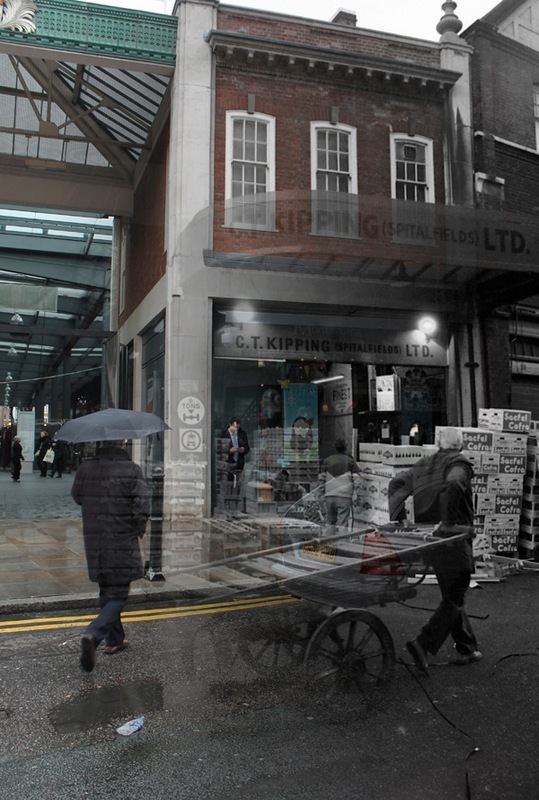 Over 10 years ago I worked at the SPAB’s offices and used to love wandering round to Spitalfields Market on my own. There was a very good second hand book shop there that I’d browse in. A few of us from the office used to sometimes go to Spitz wine bar (is that still there?) I also bought a painting from an artist in the market for my husband’s 40th birthday; the artist was a lady who imported fabrics from Thailand. It is a buddhist symbol for “health, wealth and happiness” on hand made paper in a simple wooden frame – it now hangs at the foot of our bed in Scotland. 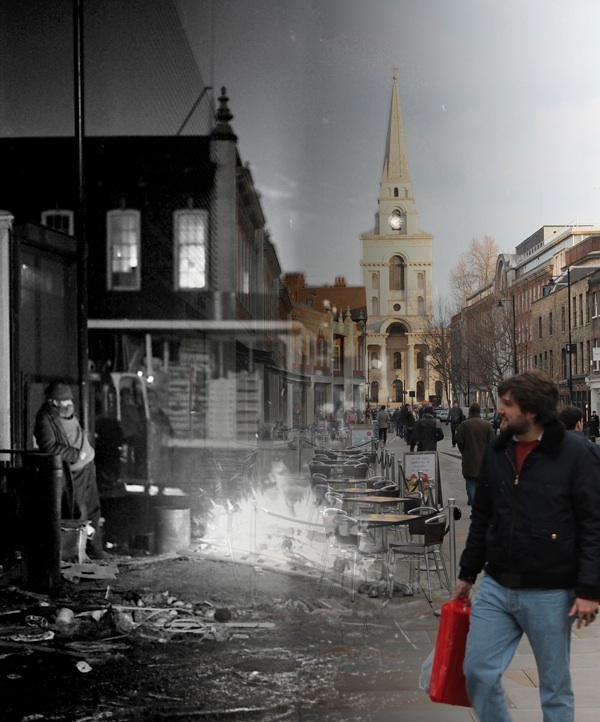 I’m visiting London soon for the first time in 9 years and I very much hope to revisit Spitalfields. I loved it dearly for the 2 years I worked there and have happy memories of that time. Thank you! Brings back memories of times when Spitalfields Market was full different vibrations, and more mysterious… I remember end of 80′s beginning of 90′s when before Christmas my girls had their faces painted, artists had their workshops… Good memories! I especially love these photos as they capture how I see my own city. They perfectly portray the experience I have when I walk streets that used to contain a beloved bakery, a grand department store, a much-visited movie theatre, even an 18th century tavern. My children have had to learn the landmarks of our city that used to exist but have since been swept away, as in Spitalfields. Just brilliant! And the writing complements the pictures perfectly. 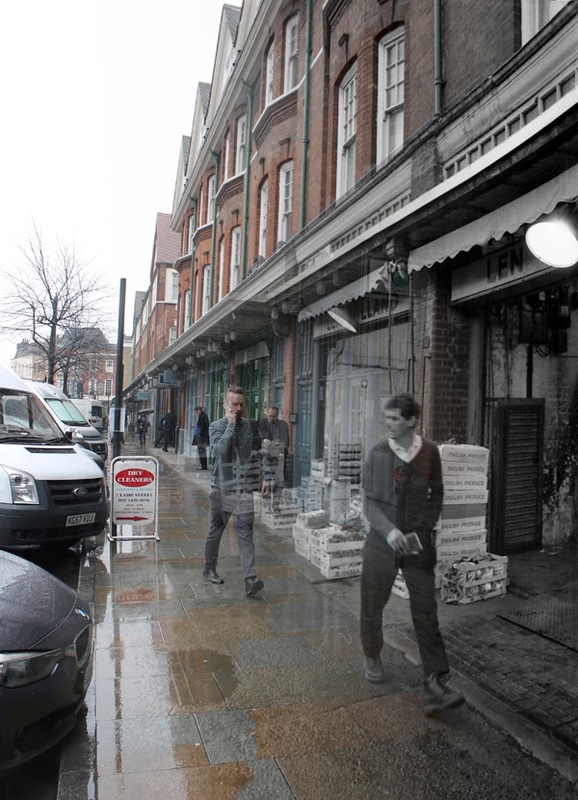 How lovely to see these photo’s it reminds me of when I walked through the market every day to go to school from my pub in Bishopsgate. These were great. I had a similar experience when I was doing research in my part of Sacramento for a novel set in 1919. I know where buildings used to be that are vanished now, and the effect is a sort of “double vision” when I take my walks. These images are amazing, so ethereal and other worldly. 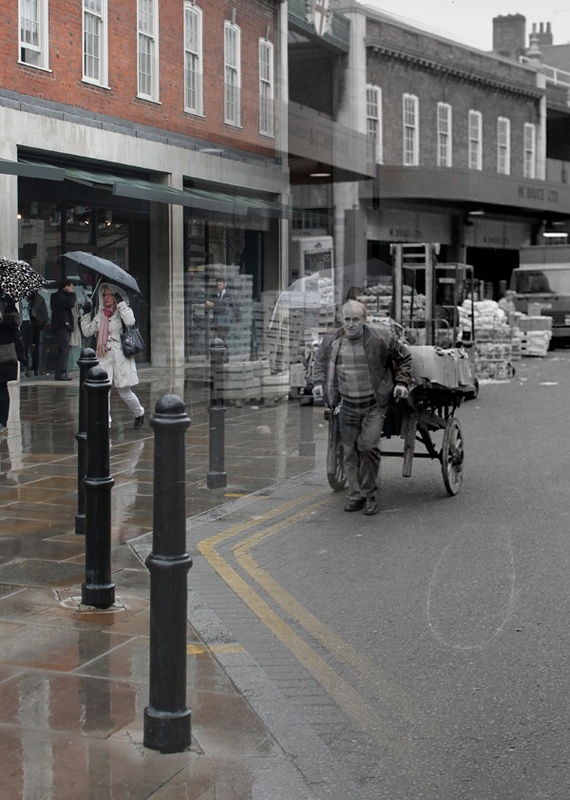 As .a child I recall the many mornings my father would leave the house in Stepney at 3am to make his way to Spitafields, returning home at 3pm his sack bag filled with veggies for our daily fare. The war took him into the Navy, but in 45 he was back with his sack The transfer to Leyton left him with a shorter journey, as we had moved to Hackney..At 15 I was on the bus passing Spitafields every day to go to work in the City, its reformation had yet begun…How small the world has become when I can sit here on the Eastern Shore of Maryland and get transported back to my childhood, I loved the visual images of past and present, hoping to make the garden tour in 2015 for my 80th BIDay. Wow, I’m amazed, just looking round the Internet at the “old East End”, and came upon this site!! 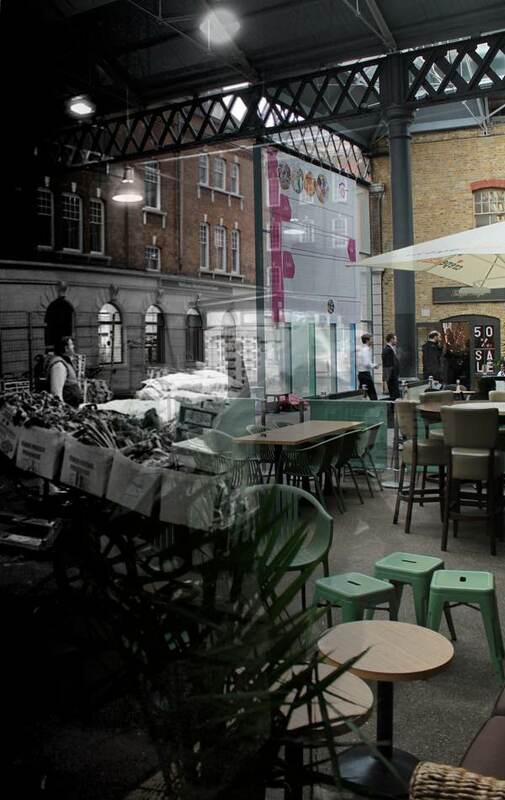 My family were in Spitalfields Market for many years, I too worked there when I left school in 1960. 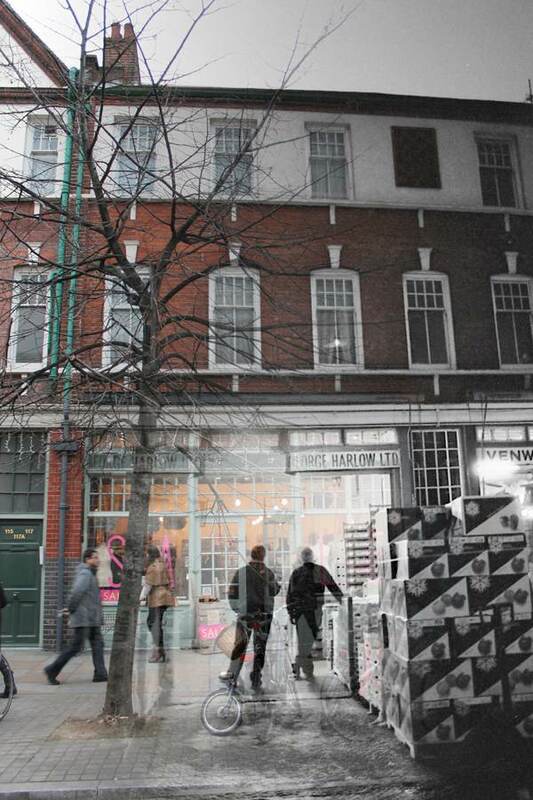 We were at 36, Brushfield Street, next door to the “Blue Cafe”. My Grandfather was nicknamed Doctor Hyams, because he used to “doctor” the samples to make them look good !!! I have many happy memories from those days, fun with all the porters and drivers, the banter etc. I did my growing up there (very quickly!” The hustle and bustle is something I will never forget. I seem to recall that there was someone who had a fruit business in Southend (I think) called Vic Chandler, and the Vic Chandler in the TV adverts for the gambling site, looks so much like him, I wondered if it may be his son. Anyone know?